Bring an unexpected detail to your look day-to-night look with these gorgeous Ross & Snow® Renata SP boots. Features waterproof Supreen® coating that offers weatherproof protection from the elements via a water-based agent specially designed for nubuck, suede, and leather. Synthetic polymers repel moisture and mud while maintaining the same soft, supple feel of your favorite footwear. 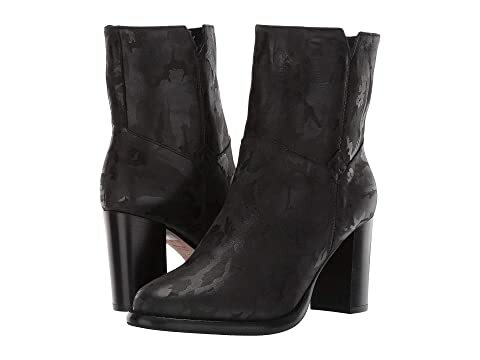 Heeled ankle boots feature a leather upper with camouflage design. Comes with two removable insoles, one shearling and one leather. Real fur: dyed shearling from lamb originated from Iceland. We can't currently find any similar items for the Renata SP by Ross & Snow. Sorry!